Gil arrived first with the new valve rods, which he stashed away safely in the TPO. I pressed on with painting rail chairs because I had limited time, as my Mum had been taken into hospital on Tuesday following a mild heart-attack. Bruce came next, and then we discussed some of the issues on 2807's log. 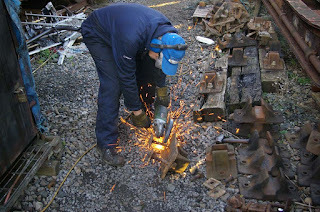 Some we are not allowed to tackle (anything attached to the boiler) and Carpo has to do those. We know the middle brake block does not make contact with the wheel - they are all new blocks and have to wear in. Regarding the spring hitting the horn stay stud, we had been puzzled by that. However, Bruce had walked alongside the loco while she was being shunted and he spotted what the problem is. It only happens when the loco goes over a bad rail joint. Unlike other locos, whose leaf spring is only attached to one wheel, our suspension has got a compensating beam between pairs of adjacent leaf spring. When one wheel gets a thump from a bad rail joint (for example) part of the force is transmitted across the beam and "shared" by the adjacent leaf spring. So the first spring doesn't get hit with the full force. Bruce speculated that this could be why the Turk (and Foremarke Hall to a lesser extent) breaks springs every few weeks, whereas we soldier on almost regardless. John ("Daily") Mayell arrived as I left, and he and Bruce painted all the prepared rail chairs in the TPO. Foremarke was on Fire & Drive duty. Kevin H was under the Turk complaining about the spring manufacturer! 'Nuff said! I completed 6 boot scrapers ready for the weekend sales by the two cafes. 2807 was in service (and should be tomorrow, too). Stuart & Gilbert were manning a stall at Winchcombe because it is [was] Carriage & Wagon Open Day. There was no one at Toddington. I restocked the F&W with 3 more boot scrapers, one of which had been sold before I'd left! I set off the alarm in the railway's store cabin (next to the Admin cabin) while trying to get some more fliers for the railway! Mildly embarrassing. But at least I know the code, now! Geof was at Winchcombe working on the siphon. Gilbert may have joined him for a while. Steve was at Toddington and cleaned up five chairs ready for painting. It was the five that were on the bench outside. Hopefully these had been carefully placed there for cleaning up and not for scrapping! Anyway, they're cleaned now and ready for the next stage.